The most tremendous QuiltNSW weekend!! 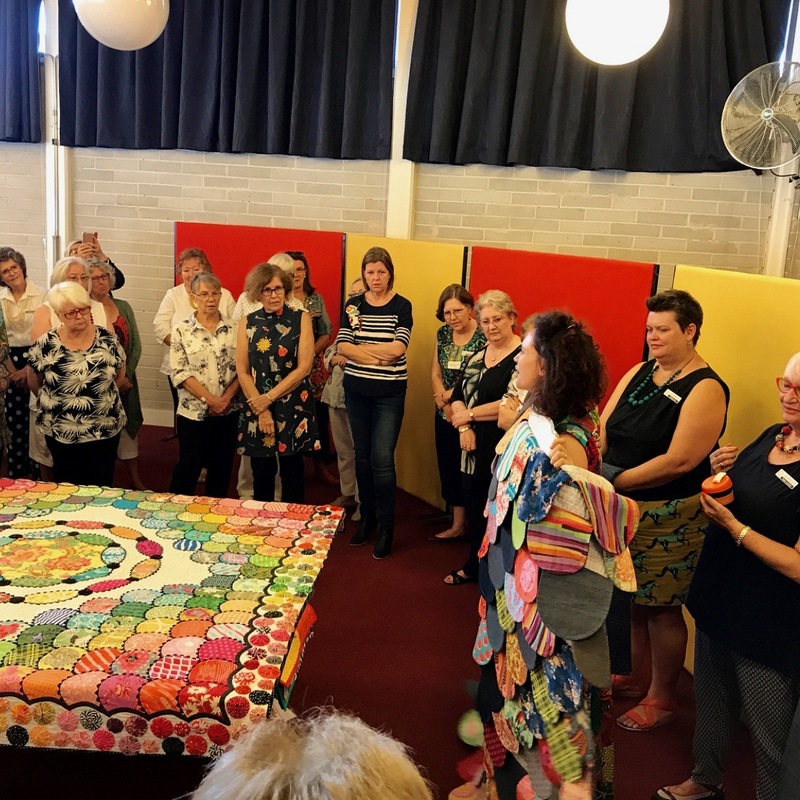 Last weekend I attended a most tremendous Quilt NSW Away meeting. Each year Quilt NSW, which is based in Sydney, holds a meeting in a regional location. 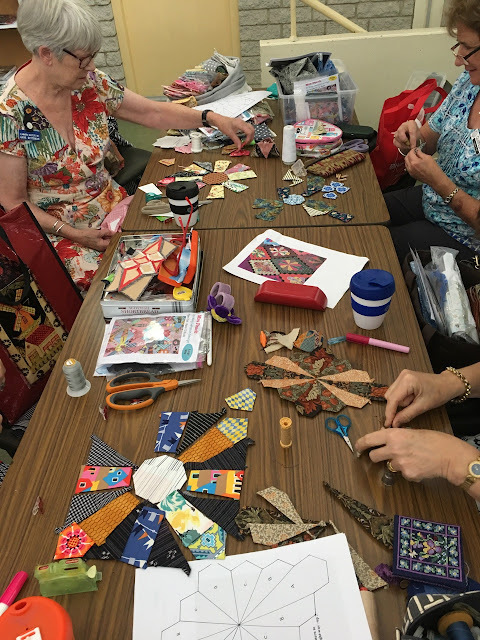 This year it was hosted by the Blue Mountains Quilters here in the Blue Mountains. It was a huge success with a record number of attendees. 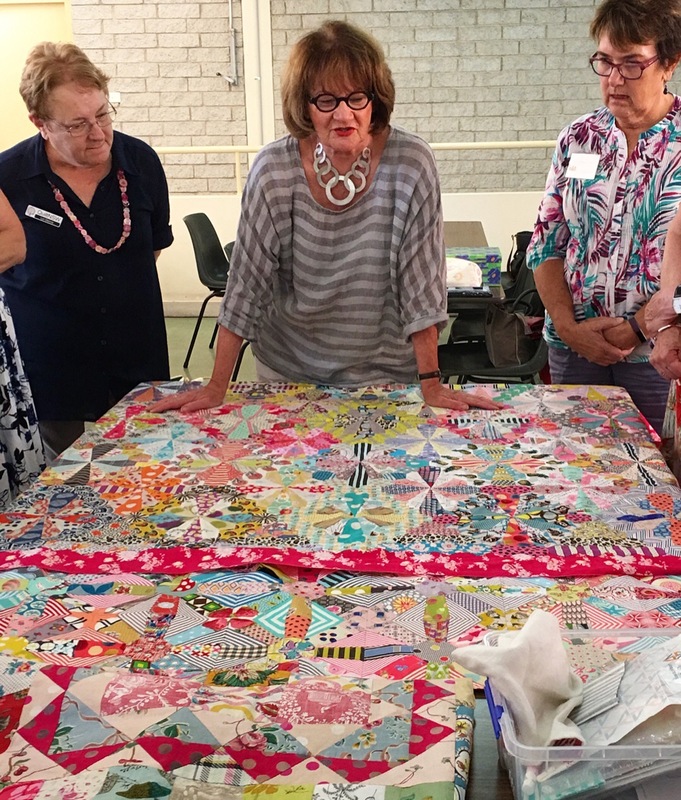 Yay, go quilters!!!! I was on first with my presentation about the quilting on my quilts. I like that it's a different way of looking at my work. 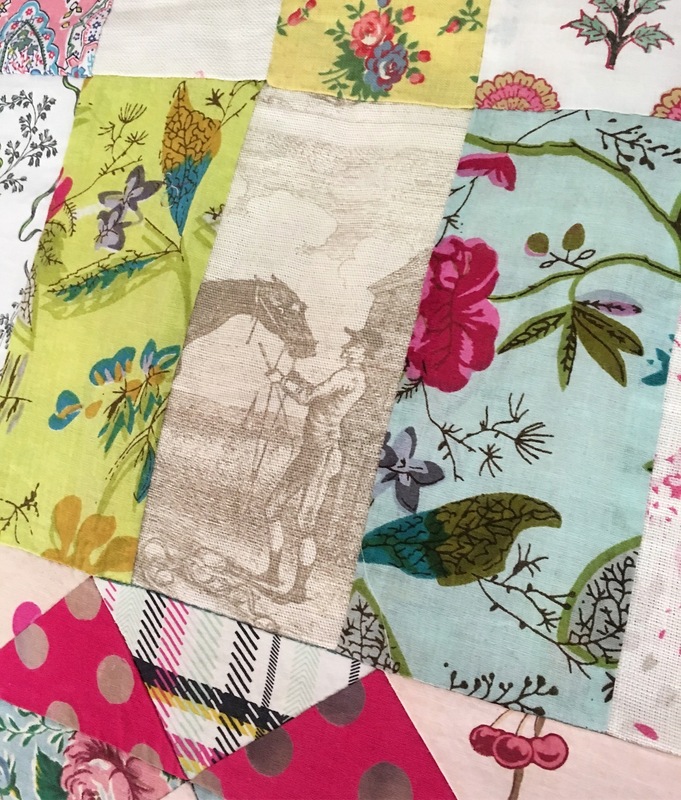 In fact I sometimes think my quilting gets lost in all the bright colours and designs of my quilts, or is hard to see in photographs so it was a great opportunity to focus on the detail of the quilting stitches. 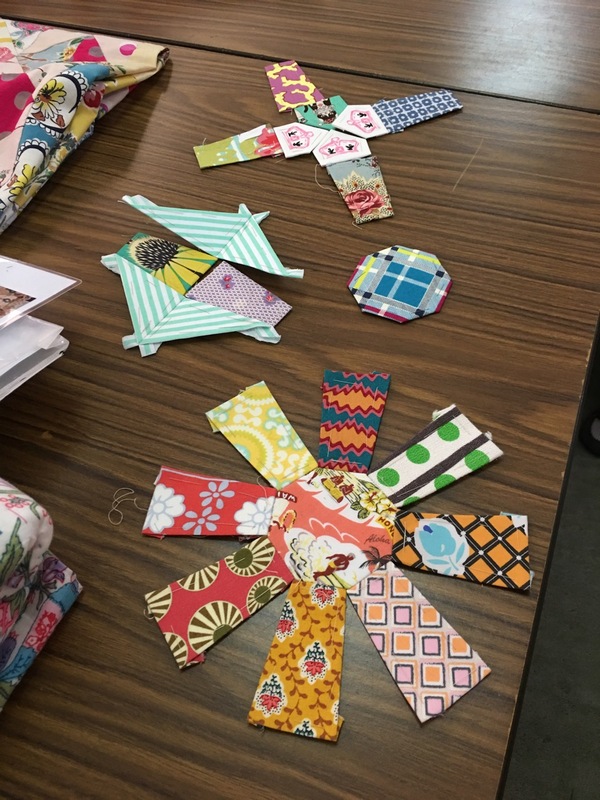 I have tried different techniques of stitching and quilt construction over the years so I hoped to impart that it's fun to try different ways of doing things. I preferred to treat my presentation as an informal chat about my approach to quilting over my journey as a quilter. 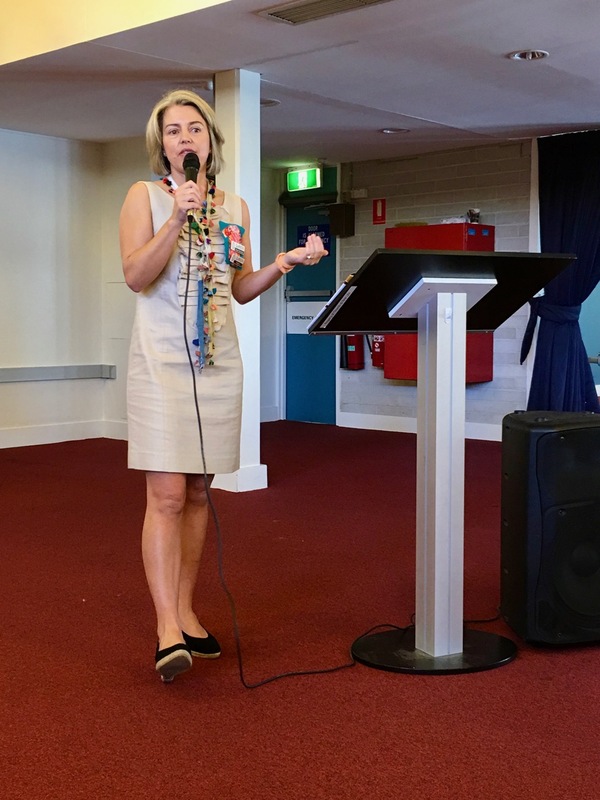 I welcomed questions throughout which opened the talk up to discussion. I, and I hope others, learnt a lot of things from peoples comments and questions in return. Knowing that attendees would have already seen many of my quilts I made sure to include quilts that I don’t often show. In fact I shared some that I never thought I’d share in public. I put an emphasis on variety, so there would be something for everybody. 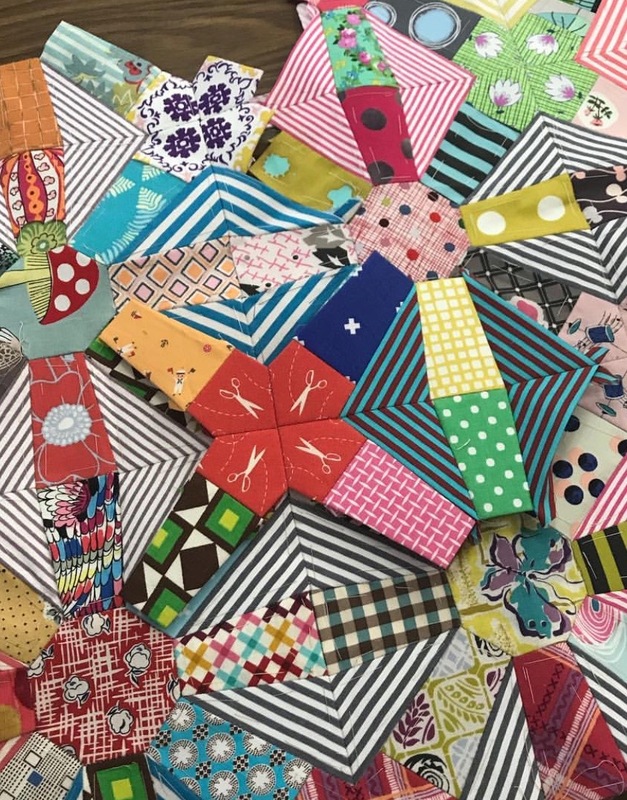 I had been asked to keep it to 10 quilts. It was hard to narrow it down but my selection of quilts included my first ever quilt of squares, my first prairie point quilt, a few of my experimental quilts, a wagga inspired quilt, some of my award winning quilts and several mini quilts. I also brought along some indian textiles that have different quilting techniques. The aims of my talk were to inspire people to not be afraid of trying new things and experiment with different techniques. To show a variety of techniques. Also that it’s okay to not be perfect. I see imperfections as beautiful because they show the maker’s hand. I have been humbled and very honoured that so many people came to listen to me talk and especially thankful to those who have since come to me with feedback about what they learnt, or told me that they were inspired by my talk. It means a lot to me to know sharing my work helps others in some way. 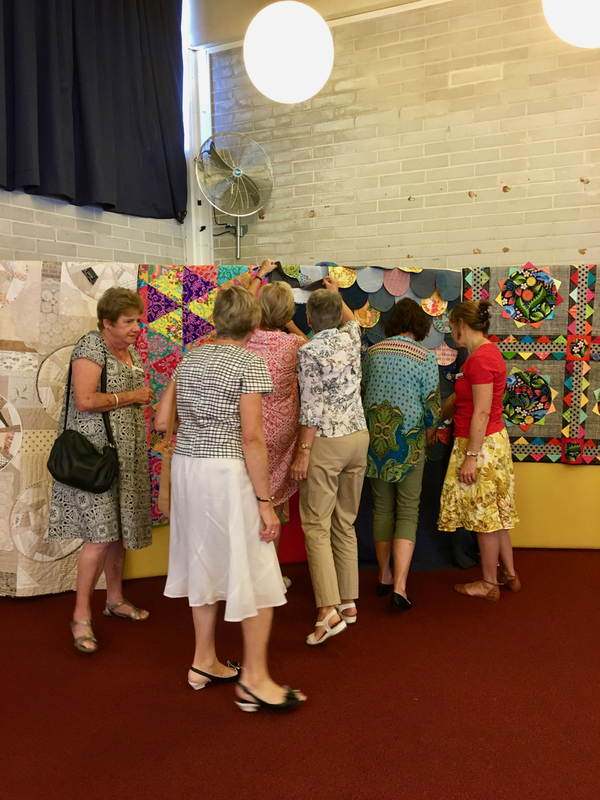 After the presentation while I was chatting to people Quilt Fairies came along and hung my quilts on boards along the wall. It was such a treat for me to see them all hanging together. 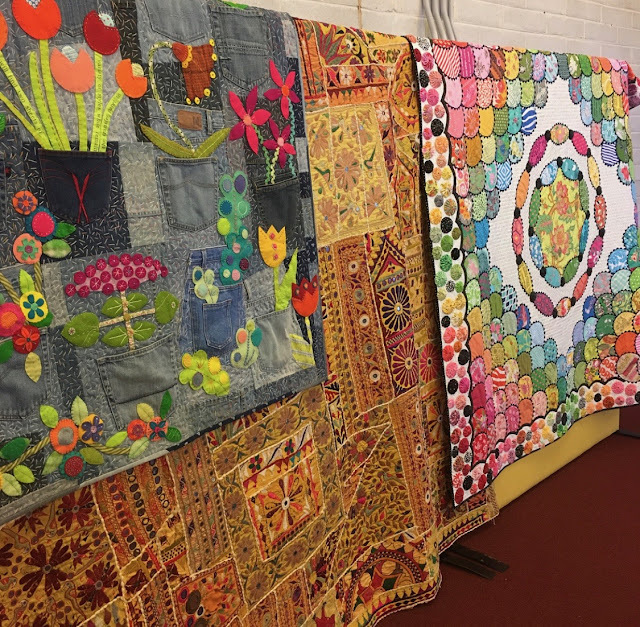 You can see what an eclectic mix of quilts I brought to show. People were especially fascinated with my Blue Jeans and Moonbeams quilt. The scallops flip up and it's reversible so it's quite an interesting quilt. For this special meeting I gave my permission for viewers to touch it so they could see the hidden details. After lunch it was time for members show and tell. 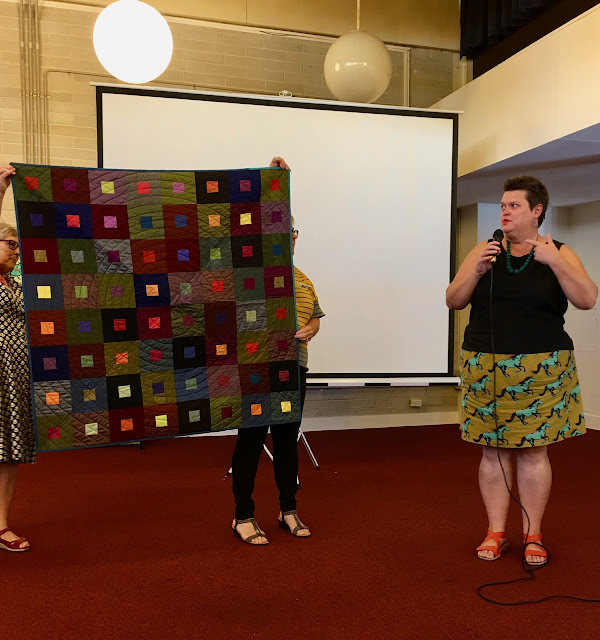 Here is Megan Manwarring, fabulous Quilt NSW president. 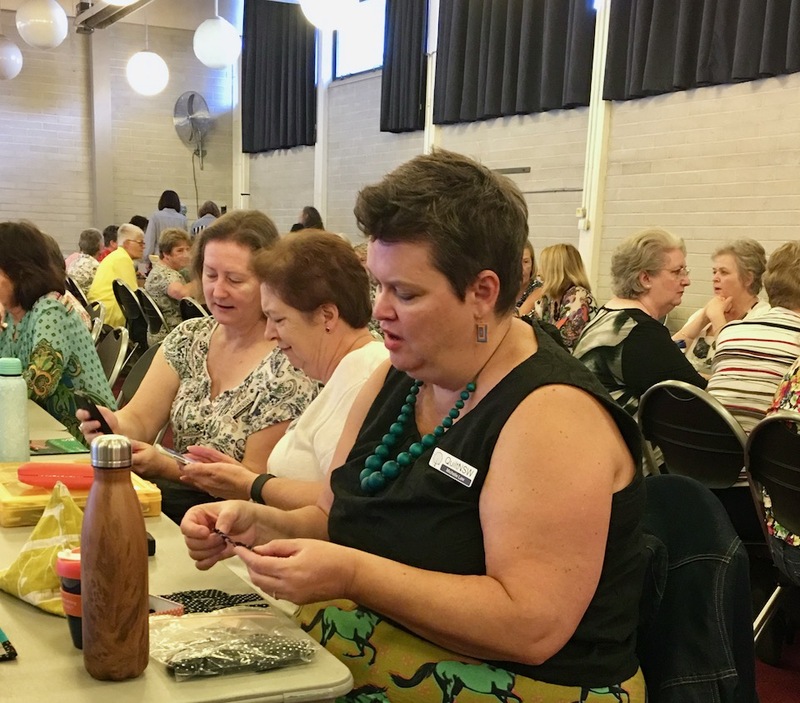 One of my favourite people in the world, Michelle from Button Tree Lane ( @Michelle the Quilter on IG) travelled all the way from Canberra to be at the meeting. Here she is with her quilt made with shot cottons. The photo doesn't do it justices. The fabrics glow in real life and I love the big circular quilting! Blue Mountains quilter Petal Davies with her amazing quilt made with beautiful Japanese silks. and here is the lovely Petal. 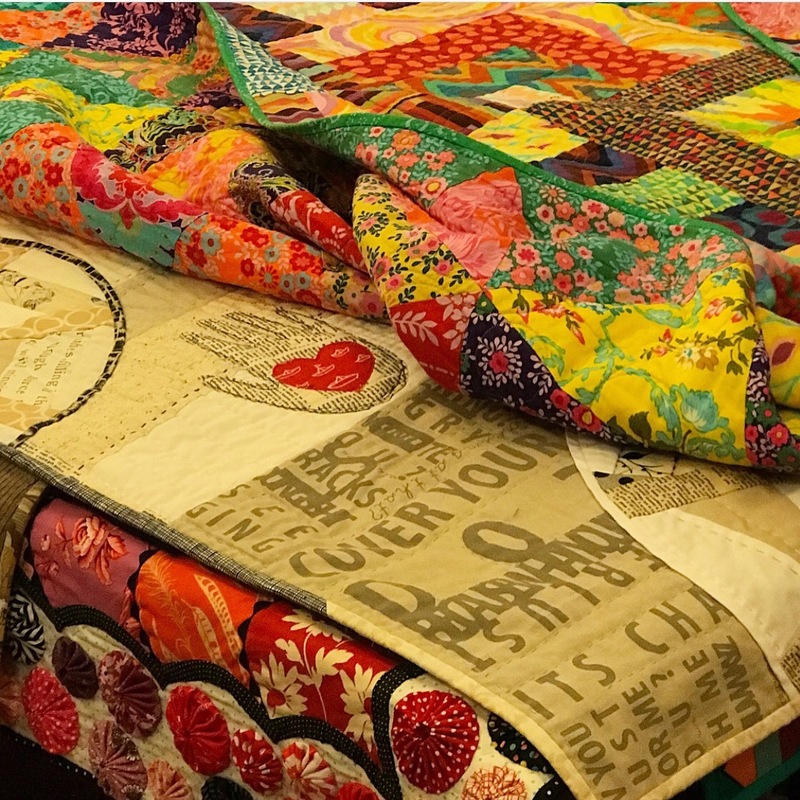 It's always nice to see the quilter behind the quilt. 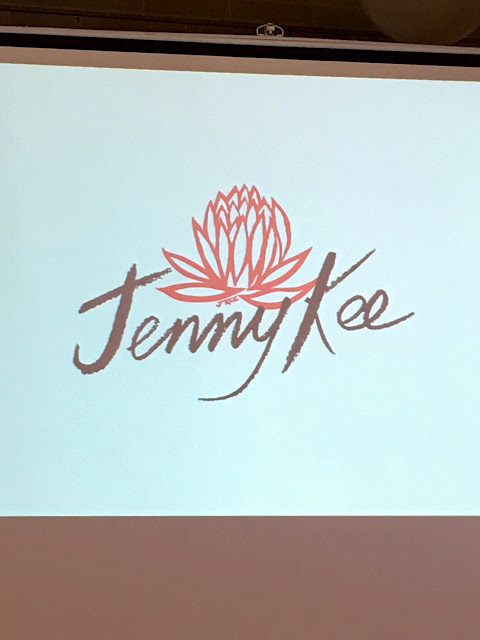 The afternoon's Guest Speaker was Jenny Kee!! Jenny was everything I expected and so much more!!! 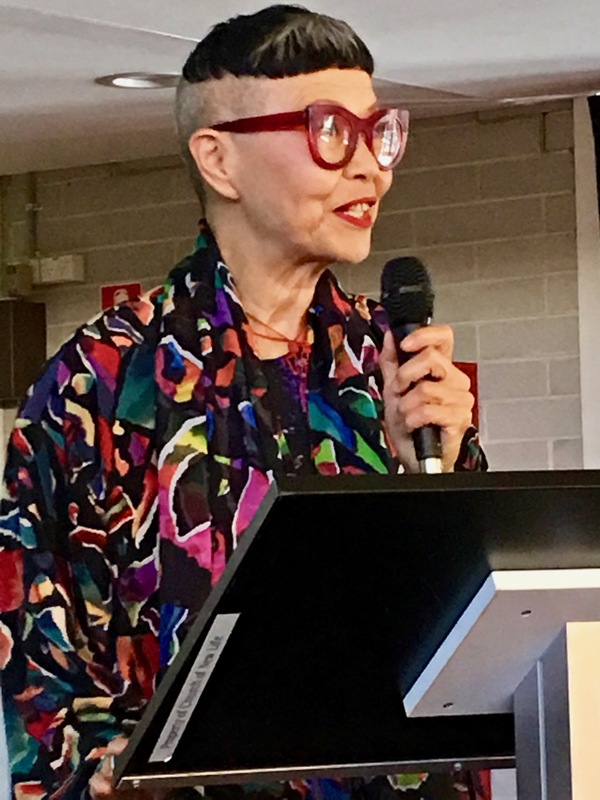 Beautiful, bright, colourful, such a wonderful voice to listen to, expressive hands, a winning smile, a zest for creativity that sparked inspiration. 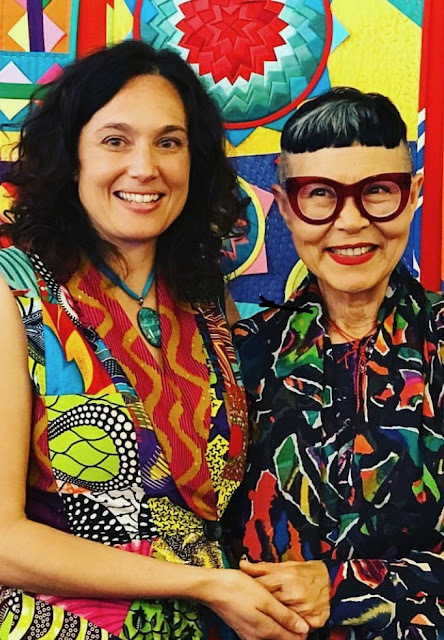 I loved hearing about her life and journey as a creative person. 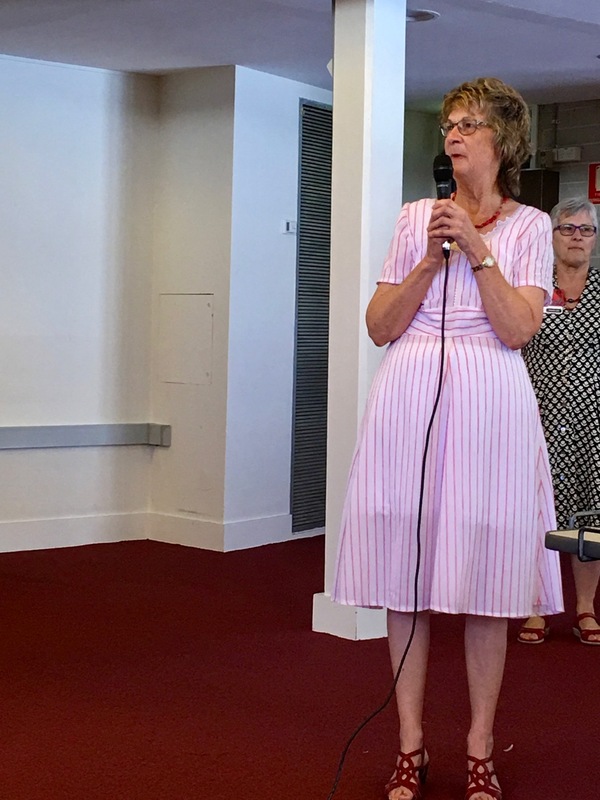 I think everyone in the room will agree it was very special to have her attend the meeting. 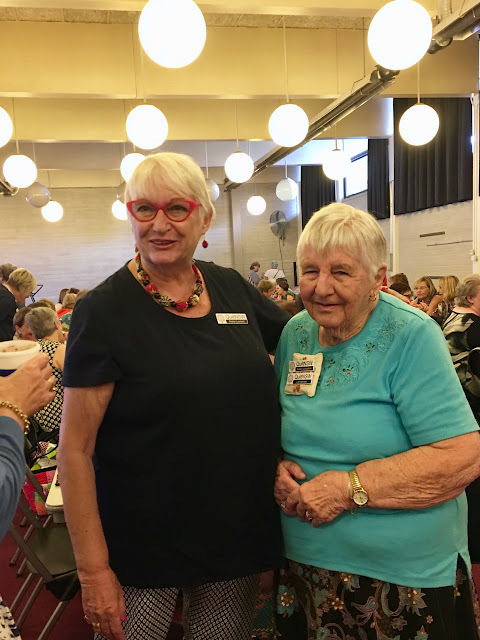 I was over the moon to meet and chat to Jenny after wards. Truly, my heart was bursting. You can see my happiness in this photo. This is a fun photo behind the scenes, When Jenny and I posed for a photo a wonderful, colourful paparazzi appeared. 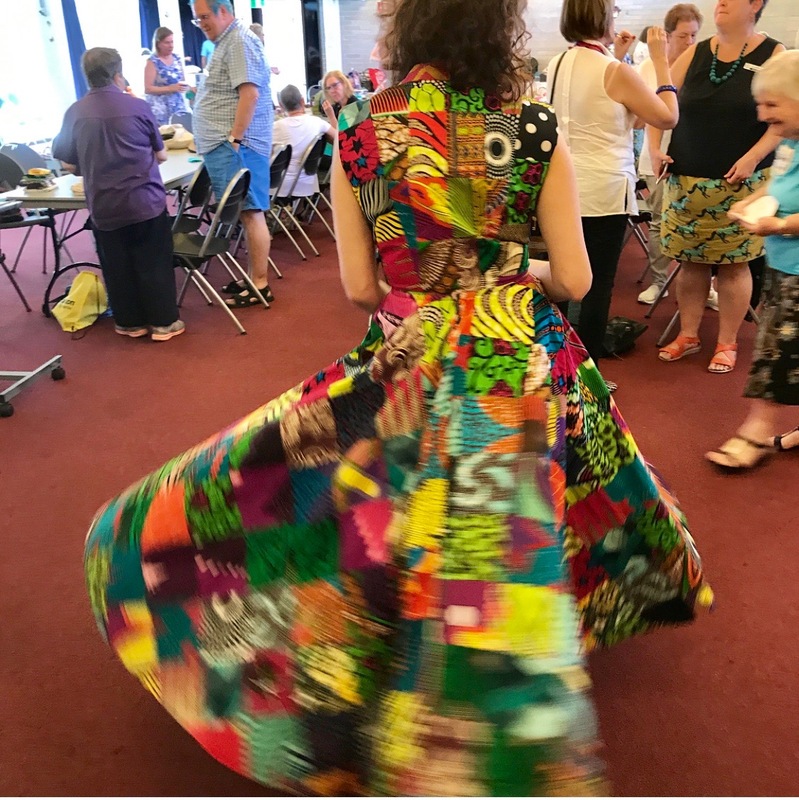 I've shown this fabulous dress on my blog before but every time I wear it I'm asked to swirl. It makes me feel like a patchwork princess.. I so enjoyed catching up with lots of my favourite people. Here is Roslyn and Isabelle. 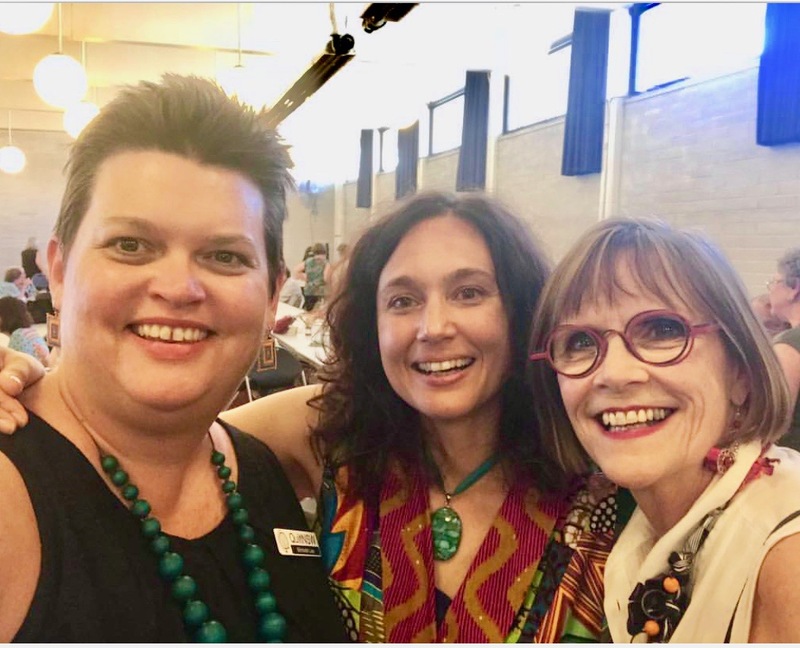 Super smiley trio - Michelle, Me and Catherine. The next day Michelle and I attended the Marg Samson George workshop. It was wonderful to see Marg's quilts in real life. I especially loved her mix of fabrics. 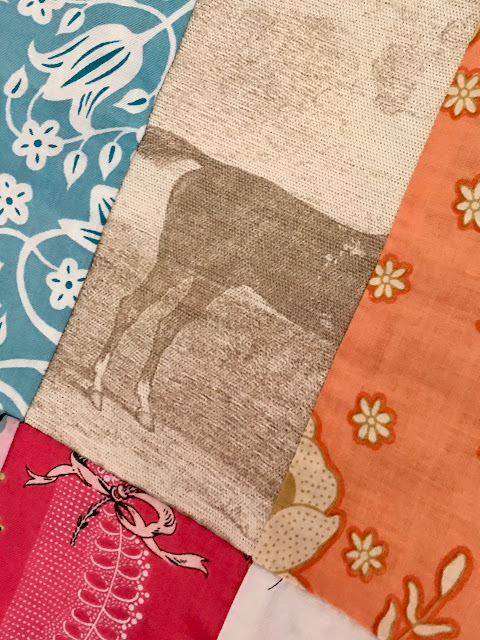 I spotted half a horse in one quilt!! Busy workshop bees making beautiful things. I did some fussy cutting for my friend Michelle, those red scissors are my handy work. It was a really enjoyable workshop. 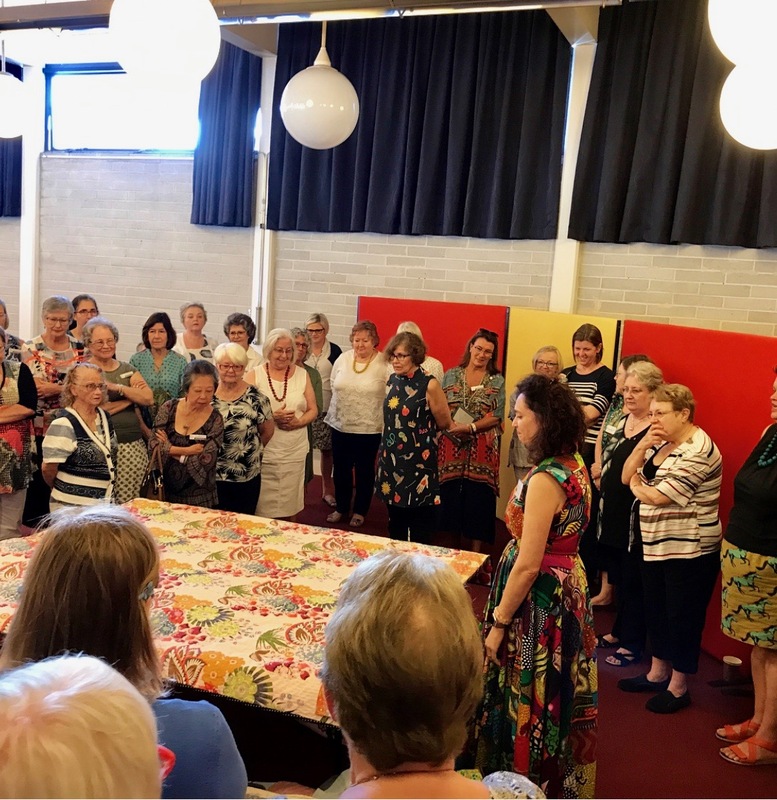 You think I'd get used to playing with fabric but cutting fabrics and chatting to lovely people was a tremendously, tremendous way to spend a Sunday. 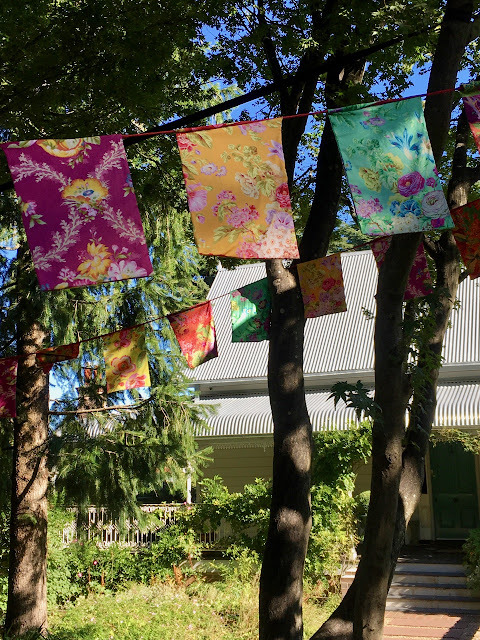 And now for some random photos.. Beautiful bunting hanging in the trees. 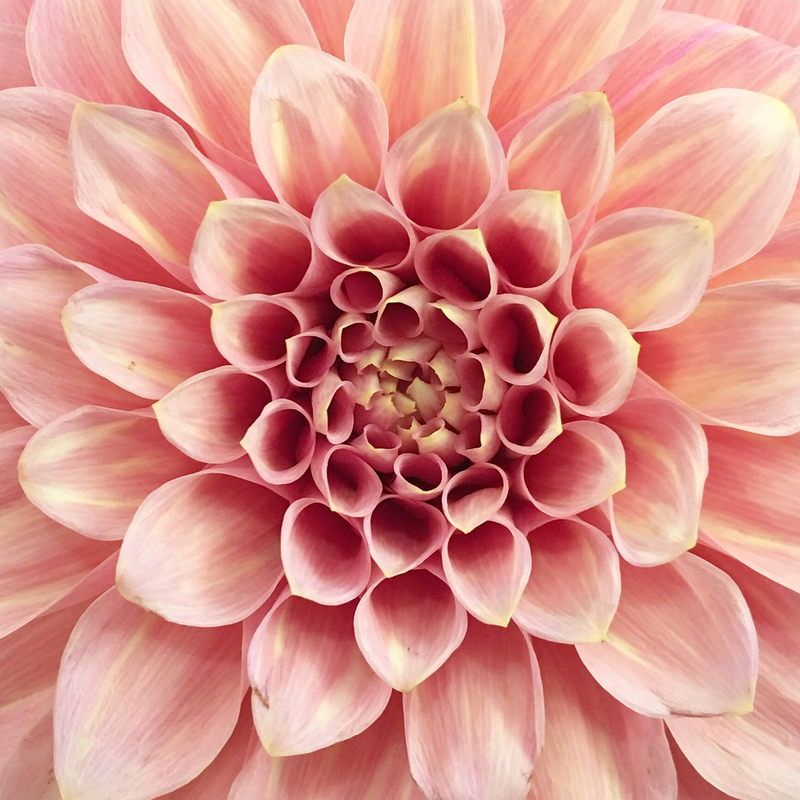 And a luscious dahlia, because sometimes it's good to stop and appreciate a flower. Wishing you all a fabulous week!! I'll be on the road again, heading up the highway to Forster, so I'll be back with travel photos in my next post. 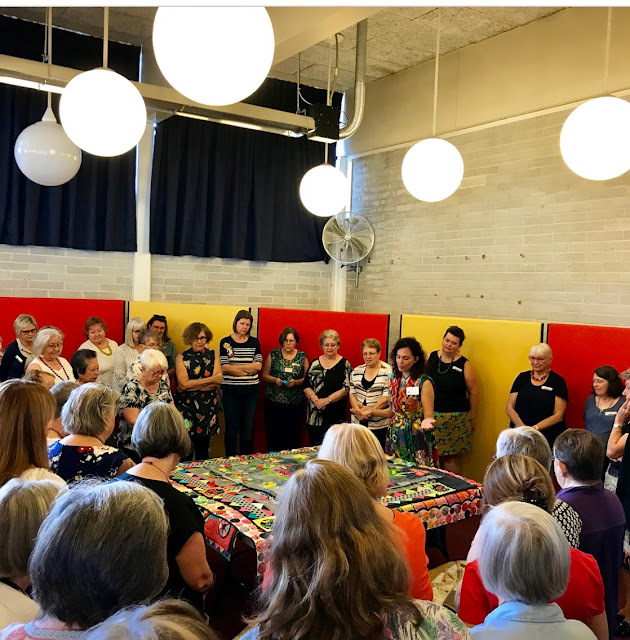 A HUGE THANK YOU to the following people for taking these photos at the Away Meeting- Kyria @thequiltopians, Michelle @michellethequilter, Catherine @ccbutterworth - You guys are awesome!! Wonderful! 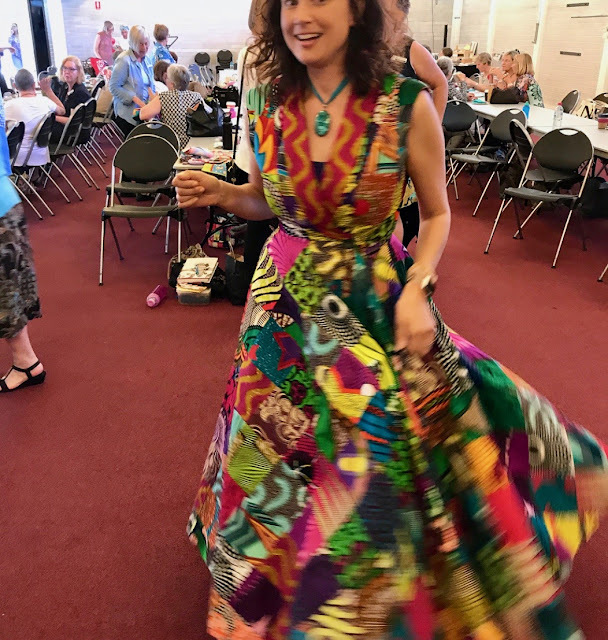 The only word I can come up with to express my feelings about your day in the Blue Mountains.....with the wonderful J Kee, and wonderful friends and well it’s all full on wonderment......and as for your dress!!! But seriously, you are one of my favourite people in the whole world too, Ms Daisy, and the weekend just wouldn’t have been the same without you, your wicked humour, Mr Daisy, our quilting friends, church second-hand stalls, 20 year old florist history, Jenny Kee, quilts, and you feeding me all weekend! I honestly had the best weekend away I’ve had in a long time and you’re mostly responsible for that! Thank you for being such a great friend and an awesome fussy cutter 🤣. 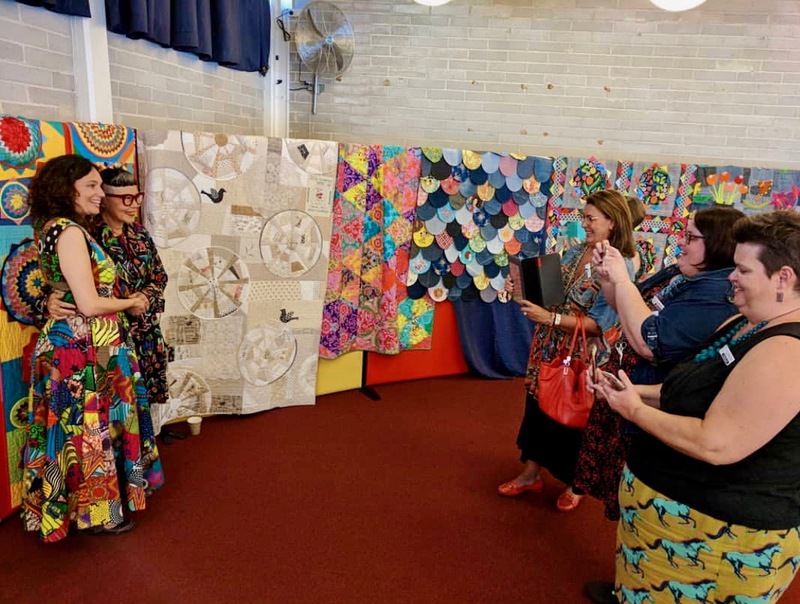 Everyone looks so happy, and I must say enthralled, as they listen to your discussion on your various quilts. 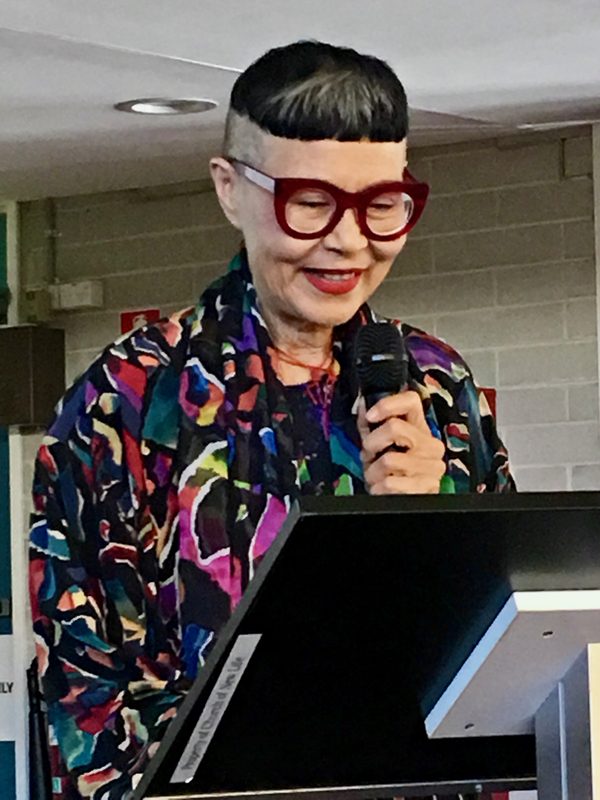 It must have all been great fun, and of course getting to chat with Jenny Kee would have been the icing on the cake. Looks like an amazing quilty day! I can't remember, did you make your dress? 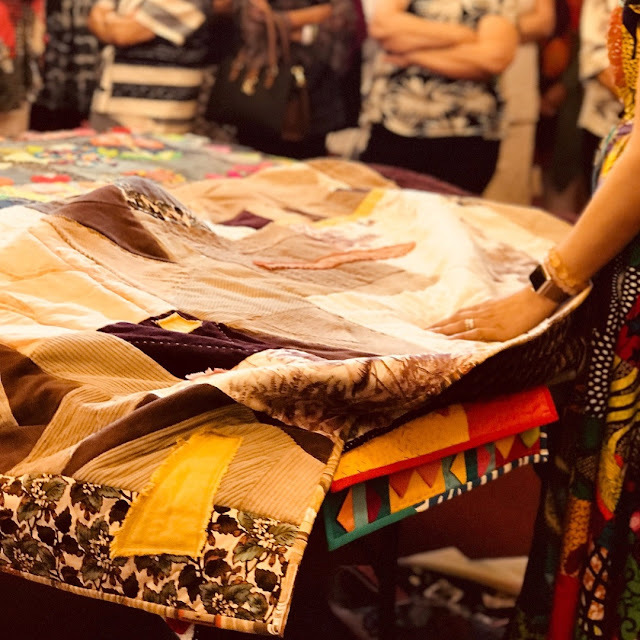 Loved seeing your quilts and all your quilt friends. What a happy colorful group of talented ladies. Such a great show. You had a taste of everything. Being a presenter is special and then listening to others is great, too. Meeting and listening to Jenny Kee would have been wonderful. 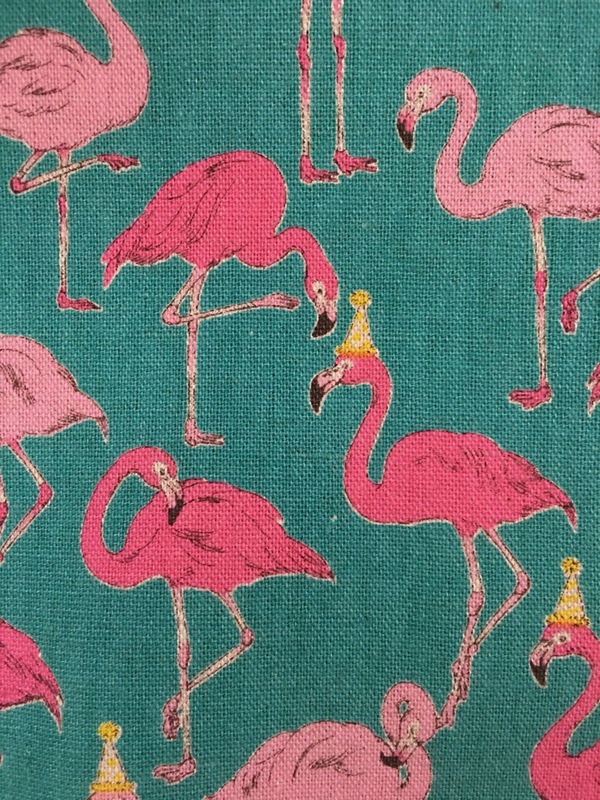 And then you got to play with fabric as well. Seems like there is very little that could have been squeezed into your time. I am so pleased it went so well. 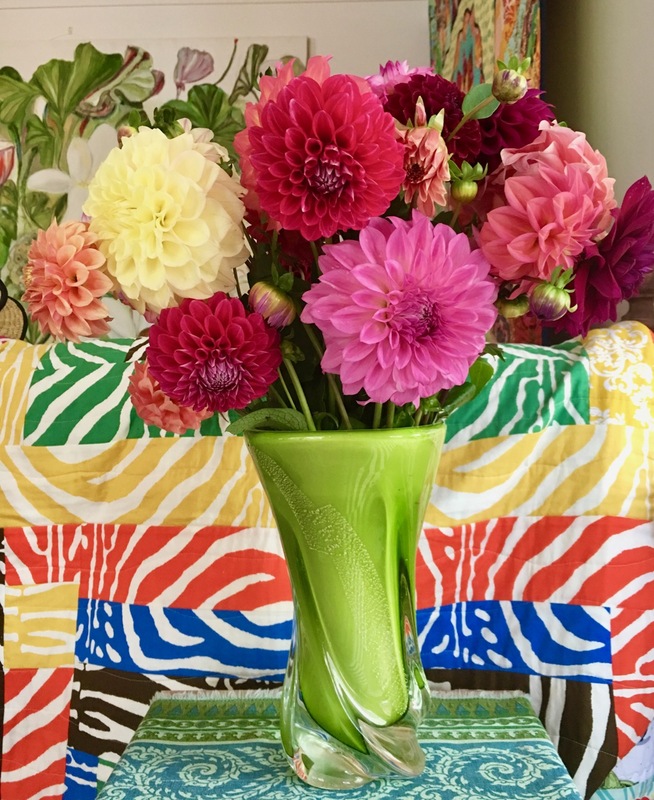 What a fabulous weekend! 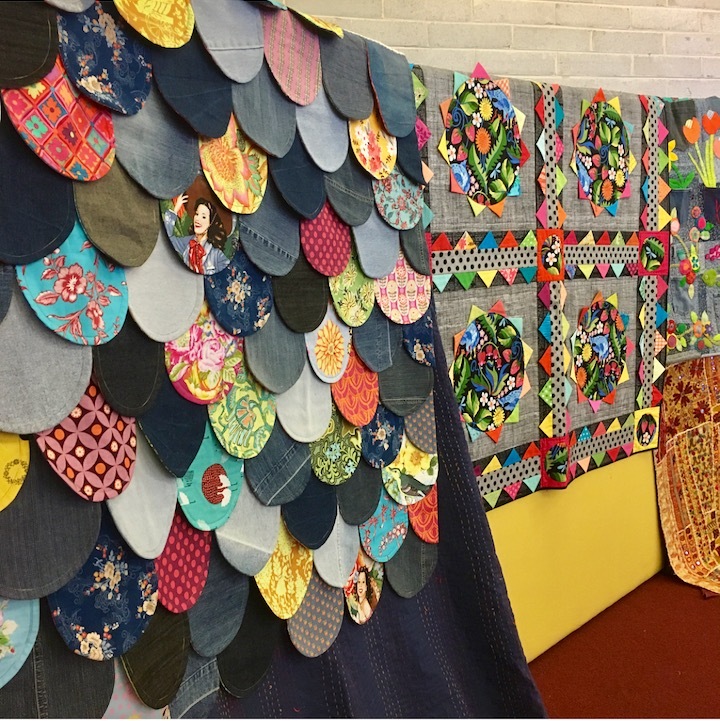 So much colour and creativity; gorgeous quilts and clothes; such talent and fun! I believe that is just too much fun for one weekend! 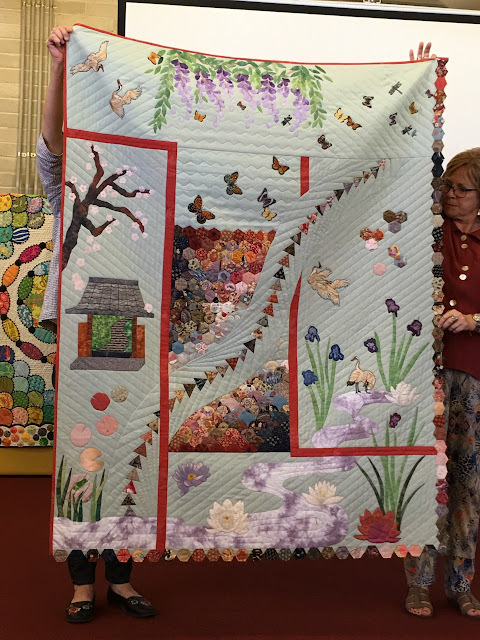 What glorious quilts and so much fun stitching together. I love your friend Michelle's horse skirt! And, BTW, your dress is perfect for you because you ARE a patchwork princess. Thanks for sharing the fun. Your life is one amazing adventure. I'm so happy for you and happy that you take the time to share your journey. Enjoy!